The Tampa Museum of Art always comes up with an out-of-the-box experience for Draw In visitors. This year, Anthony Record, studio programs coordinator for Tampa Museum of Art, will man a Jackson Pollock-style drip-painting booth. 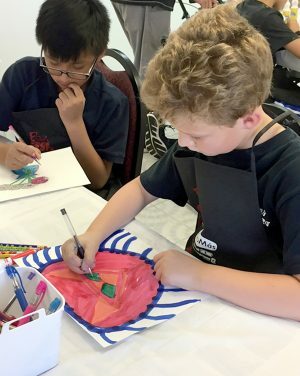 The Firehouse Cultural Center invites you to “come play with your creative side” from 1 to 3 p.m. April 13, when it hosts the Draw In, an arts-filled event for folks of all ages. Children and adults can join a variety of fun, interesting activities, led by professional artists and educators. And it doesn’t matter if you’ve ever picked up a pencil in your life. Artist Bruce Marsh, of Ruskin, will facilitate indoor and outdoor drawing circles, where folks of all skill levels can explore their inner artist. Retired art teacher Norelle Siliati, of Riverview, will teach printmaking with fish and ferns; while Susan Fredricks, of the Tampa Museum of Art, leads a session on large-scale painting with brooms and brushes. 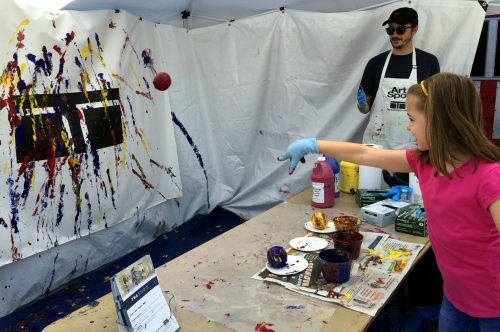 Anthony Record, studio programs coordinator for Tampa Museum of Art, will man a Jackson Pollock-style drip-painting booth. And Dee Hood, of Ruskin, will facilitate an abstract, mixed-media project. Children find lots of creative, hands-on activities at the Firehouse Cultural Center’s annual Draw in. Carswell, a resident of Sun City Center, will lead “Chalk It Up,” a figure-tracing activity. Finally, Michael Parker, of Ruskin, will return with his one-of-a-kind customized bikes to be used in yet another arts-related activity. Background music will be provided by WPHX 101.9 FM, and the International Mobile Kitchen will be on site to sell its specialty foods. Additionally, certified hoop instructor Serina Lang will demonstrate hula-hooping and have hoops available for visitors to twirl. Representatives (and possibly kittens) from The Critter Adoption and Rescue Effort Shelter in Ruskin will also be on hand. “Art is art is art,” said Beth Stein, Firehouse Cultural Center programming coordinator. “The enjoyment you find is not only in creating it but also in how you feel while you’re doing it. Draw In activities will take place indoors and outdoors throughout the entire campus. Everything is free. The Firehouse Cultural Center is at 101 First Ave. NE, Ruskin. The 501(c)3 nonprofit organization offers year-round classes, workshops and entertainment. Scholarships are available to those in need. For information on its programming, becoming a member or making a tax-deductible donation, call 813-645-7651 or visit www.firehouseculturalcenter.org.